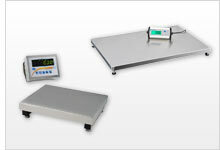 PCE Instruments (PCE) offers a wide range of platform scales. Depending on the model, PCE's platform scales can be equipped with USB ports, RS-232 interfaces or Bluetooth adapters to allow weighing data to be transferred to a computer for detailed analysis and documentation. PCE platform scales are calibrated by the manufacturer or factory. ISO-calibrated platform scales are calibrated by an ISO-certified laboratory. An optional ISO calibration certificate is available for purchase as an accessory to almost any platform scale for sale by PCE. If you have any questions about the platform scales found on this website, please contact PCE's technical sales and support team at or +44 (0) 2380 987 035 for PCE Instruments UK, or at or +1 (561) 320-9162 for PCE Americas Inc.
PCE-PB 150N is a multipurpose industrial platform scale with ZERO, TARE and part counting (PCS) functionality. This heavy-duty digital balance features a removable stainless steel pan for easy cleaning. The scale weighs units in either grams (g), kilograms (kg), pounds (lb) or Newtons (N), and is powered by battery or AC power. Ideal for shipping, receiving, manufacturing and general purpose use, this versatile scale has a large LCD for easy viewing, simple 4-button operation and a USB interface for connecting to a PC. PCE-PB 60N is a multipurpose industrial platform scale with ZERO, TARE and part counting (PCS) functionality. This heavy-duty digital balance features a removable stainless steel pan for easy cleaning. The scale weighs units in either grams (g), kilograms (kg), pounds (lb) or Newtons (N), and is powered by battery or AC power. Ideal for shipping, receiving, manufacturing and general purpose use, this versatile scale has a large LCD for easy viewing, simple 4-button operation and a USB interface for connecting to a PC. The robust platform scale is a real all-arounder. The stand of the platform scale can be easily separated along with the tripod mount from the platform and possibly sunk into the workbench. The cable between the platform and the display has a plug attached and is about 1.6 m long. The robust platform scale is perfect for all general weighing tasks. The stand of the platform scale can be easily separated along with the tripod mount from the platform and possibly mounted on the workbench. The cable between the platform and the display has a plug attached and is about 1.6 m long. P1 is 400 x 500 mm size. Extremely affordable, platform scale for everyday use. The platform scale has a platform size 600 x 900 x 80 mm. The capacity of the platform scale is 75 kg or 150 kg. Initialise the balance, weigh - it could not be easier. The robust platform scale is a real all-rounder. The stand of the platform scale can be easily separated along with the tripod mount from the platform and possibly sunk into the workbench. The cable between the platform and the display has a plug attached and is about 1.6 m long. The platform scale PCE-SD 30C is a low-cost robust verifiable system balance. The calibration of the platform scale is according to the trading class M III. The sturdy foundation of the platform scale is made of painted steel and features a plastic-coated steel platform. The platform scale PCE-SD 60C is a low-cost robust verifiable system balance. The calibration of the platform scale is according to the trading class M III. The sturdy foundation of the platform scale is made of painted steel and features a plastic-coated steel platform. The platform scale PCE-SD 150C is a low-cost robust verifiable system balance. The calibration of the platform scale is according to the trading class M III. The sturdy foundation of the platform scale is made of painted steel and features a plastic-coated steel platform. The platform scale PCE-SD 153C is a low-cost robust verifiable system balance. The calibration of the platform scale is according to the trading class M III. The sturdy foundation of the platform scale is made of painted steel and features a plastic-coated steel platform. The platform scale PCE-SD 303C is a low-cost robust verifiable system balance. The calibration of the platform scale is according to the trading class M III. The sturdy foundation of the platform scale is made of painted steel and features a plastic-coated steel platform. The platform scale PCE-SD 63C is a low-cost robust verifiable system balance. The calibration of the platform scale is according to the trading class M III. The sturdy foundation of the platform scale is made of painted steel and features a plastic-coated steel platform. The platform scale PCE-SD 300C is a low-cost robust verifiable system balance. The calibration of the platform scale is according to the trading class M III. The sturdy foundation of the platform scale is made of painted steel and features a plastic-coated steel platform. The platform scale PCE-RS 2000 is designed for stationary use. The robust construction makes this platform scale particularly well suited for weighing large objects. The platform scale is made of painted steel. Verifiable waterproof platform scale in stainless steel with separate indicator (no corrosion). The multifunctional scale is manufactured to IP67, dust-tight and thus can also be temporarily submerged completely under water (up to 1 m depth). The platform scale PCE-SD CR series finds its application both in many production areas as well as in shipping areas. The platform scale features a standard RS-232 interface. In addition the platform scale PCE-SD CR series can be equipped with further interfaces. The weighing platform PCE-IS01 is a professional system for counting, and consists of a quantity and a reference scale. The reference scale takes on the smallest components while the balance calculates the number of pieces. This weighing platform is particularly well suited for inventories.